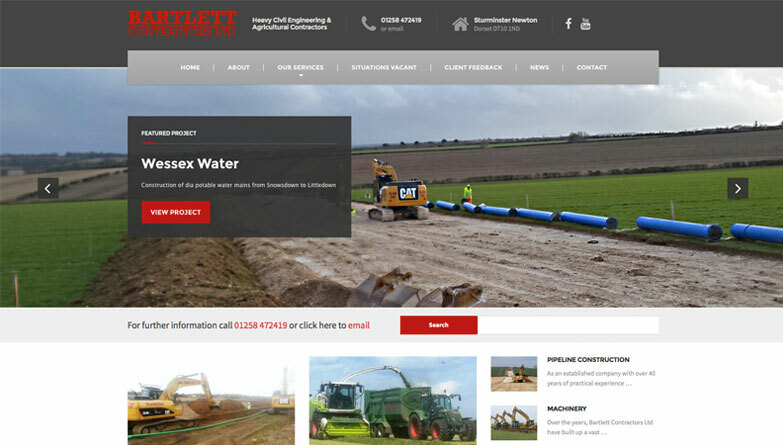 Bartlett Contractors specialise in Rural and Heavy Civil Engineering, Agricultural Work, Haulage, Plant Hire, Drainage and Pipeline Construction. The family name of Bartlett’s has been synonymous with general ground works, plant hire and agricultural contracting in the South West for over 55 years. Bartlett Contractors Ltd has built on this wealth of expertise and offers an increasing range of nationwide services specialising in rural civil engineering contracts while continuing to expand the heavy civil engineering side of the business. Status: Ongoing the site provides an information platform for services as well as comprehensive listing of plant available plus video and news on recently completed projects. Fully responsive with client access for expansion and amends as and when required.